Gov. Bill Lee (Left) leads hears presentations from state agencies during budget hearings at the capitol January 28, 2019. Parker’s team told Gov. 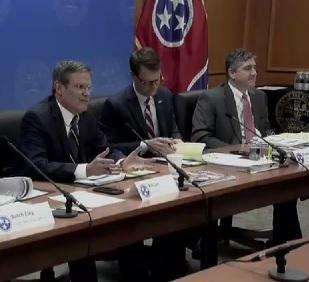 Lee that Tennessee will have the nation’s second lowest paid corrections officers when the new state budget takes effect in July. Then during Monday’s presentations, the Department of Children’s Services warned it also needs millions of dollars in new funding. Commissioner Jennifer Nichols told Gov. Lee that since 2016 her department has seen a more than 10 percent jump in the number of children in state care due to the opioid epidemic. She noted that some of Tennessee’s neighbors have seen increases that are even more dramatic. “Georgia has a 72.81 percent increase. Mississippi has 43 percent increase. Alabama has a 26 percent increase." Children Services is requesting $78 million in budget increases through state and federal money, including $64 million more for foster children case management and treatment services. NASHVILLE, Tenn. (OSBORNE) -- Gov. Bill Lee is settling into his new job this week on Capitol Hill after taking the oath of office on Saturday. During his inaugural speech, Lee stressed many of the same policy priorities he campaigned on: Criminal justice reform, a new emphasis on vocational education, and building on the state’s strong economy. But Lee noted that while the state as a whole may be prospering, many Tennesseans are struggling.